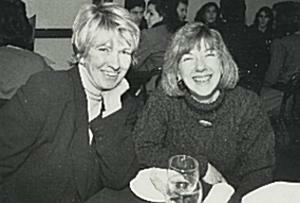 Watching the recent Martha Stewart trial, I couldn’t help but remember my own long-ago dinner with the diva. I was a young features reporter at the Boston Herald, and she was already the czarina of domesticity but not yet a media mogul. There was a blizzard that day, and she arrived late, sweeping in the door of Olive’s in Charlestown on a gust of wind. The restaurant’s staff, dazzled by having the lifestyle goddess in the house, hurried over with a basket of fresh onion rings. Instead of accepting them graciously, she demanded to know what kind of oil they had been fried in. Only when she had determined that it was the requisite canola was she willing to sample one. I knew instantly it was going to be a tough night. She was a woman on a mission: Promote book (in this case, her glossy gardening tome.) I was hoping to get a little color piece on a woman people both reviled and adored. She was having none of it; deviations from her set script were unacceptable. When I asked what she did for fun, she launched into a discussion of rehabbing the arboretum. When, desperate for an unprogrammed comment, I asked if she was mobbed when she went to the mall, she looked at me as if I had just asked if Turkey Hill had indoor plumbing. “I don’t go to the mall,” she said icily. Still, despite her lack of warmth, I admired her for all the qualities I now look for in any executive I interview: creativity, imagination, drive, commitment to excellence, and toughness. She may not be a cuddly person (frankly, I’ve learned that not many moguls — men or women — qualify in that category), but she nearly single-handedly created one of the most compelling and powerful brands of the last several decades. Plus, she’s still the only CEO whose recipe for ginger scones I truly cherish. I hope she’s back in the kitchen soon.